There are simply no records available anywhere that tell the stories that probate records do. These are, as the name of The Legal Genealogist‘s class for Ancestry Academy points out, The Records of Death. They report and document the deaths of many of those who came before us. But they also document so very much of the lives of the survivors. And they tell such stories. Like the one I came across from Wayne County, Michigan, just yesterday. A story of brothers that didn’t quite get along… and a teenager who wanted things more his own way. Imagine, if you will, the situation of Edward Vernier dit Laducere, 16 years old, and an orphan. His father, Charles, died sometime before 1850. His mother, Marie, died about the first of July 1850. He was the youngest of four brothers, with Charles, Daniel and John Baptise being older than he was. Charles was the only one of age in 1850, so he was named as the guardian of his younger brothers. 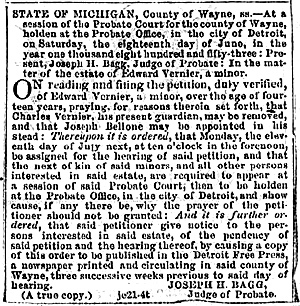 The year at the time of this court record was 1853, Edward was living in Wayne County, Michigan, with his guardian and older brother Charles. Charles, at the time, was the grand old age of 24. And, according to Edward, he was bossing Edward around. And, it almost goes without saying, Edward didn’t like it one bit. So he wanted somebody else as his guardian, instead. Now the personal story by itself is worth the effort of tracking down these records. I mean, seriously, doesn’t this whole thing strike you as about the kind of story you’d hear from (and about) almost any teenager, at almost any time? And wouldn’t this detail be a joy to include in a family history? But of course there is more in the file. We learn about work in the area braiding straw hats, and chores like picking apples and milking the cow, raking hay and picking corn. We find a map with the land of the deceased Vernier father and how it will be partitioned among the sons. We see what the taxes were on the property. We learn what legal fees were like at the time — Charles paid his lawyer $5.00 in legal fees for representing him in the dispute. Which, by the way, ended with a new guardian, but no other repercussions for Charles. Battling brothers. Local conditions. The value — and annoyances — of work. Oh, yes, the stories that probate records tell. Oh I love this post. Probates truly do reveal things we couldn’t find any other way and this one is priceless. I always smile to think how they had no idea that years down the road their descendants and others would be reading the stuff they said. At least they didn’t have to worry about Facebook.